Twin brothers Hans Frank and Leo Frank were born in Vienna on 13 May 1884. They were both students of Anton von Kenner at the School of Applied Arts in Vienna and Franz Rumpler at the Vienna Academy. 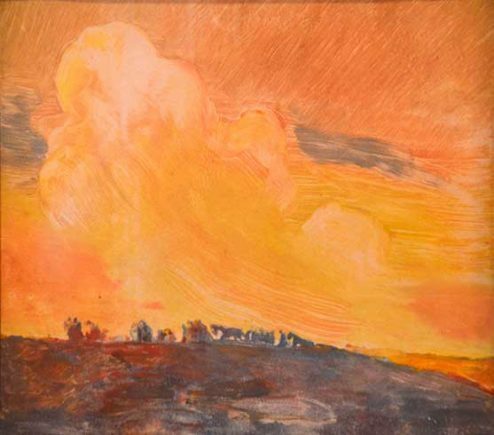 Hans Frank was a painter and printmaker, working in both aquatint and color woodcut and he exhibited at the Vienna Secession in 1912 and 1913. During World War I he served as an artillery regiment officer but after the war he travelled extensively through southern France, Italy, and Austria. Frank was awarded numerous prizes, including the Golden State Medal in 1908, the Silver Medal of the City Graz, the Royal Sakson Medal for Art and Science, the Staatlicher Ehrenpreis, the Prize of the City Vienna in 1931, the Goldene Ehrenmedaille des Wiener Künstlerhauses in 1934, the Waldmüllerpreis für Malerei, and the Kriehuber-Preis der Stadt Wien in 1944. He was a member of the Künstlerhaus in Vienna, the London Society of Graver Printers, and the California Society of Printmakers. His favorite motifs were birds and forest animals depicted in their natural habitats. Hans Frank has for the last few years exhibited at the Secession, but not till last autumn, when his varied productions were assembled for the first time, could the wide range of his art be properly appreciated. The collection contained some large landscape paintings remarkable for their breath and depth of treatment, and numerous etchings, aquatints and woodcuts, the subjects being chiefly animals and landscapes. Birds are his favourites, and his treatment of them, founded as it is on close observation, at once impressed critics and public alike. The two aquatints here reproduced will show how surely the artist is in his methods. As a wood-engraver he has accomplished some fine work, carried out by methods of his own. He cuts his own blocks, choosing the wood himself, and his tools are made to his own requirements. From his childhood a lover of animas, he early began to study their ways, and became a constant visitor to the Schonbrunn Zoological Gardens. Later he kept birds in his studio, where he could be in closer contact with them and learn their habits. Hans Frank died in Salzburg, Austria on December 19, 1948.